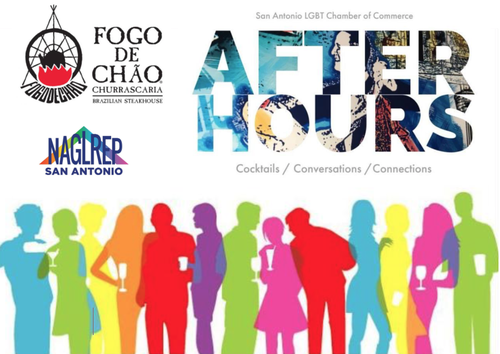 Join us for our February Mixer at Fogo de Chao, an Upscale Brazilian chain for all-you-can-eat meat carved tableside in San Antonio, located at 849 E. Commerce, #393, San Antonio, TX 78205. We will have networking, cocktails (cash bar), and some heavy appetizers and hand-passed meats (skewered smaller portions for easy eating)from 6:00 – 8:00 PM. Don't miss the opportunity to mix and mingle with other professionals. Bring your business cards. For Free Parking Tuesday Downtown Information, visit: https://www.downtowntuesday.com/Parking-Map. For more information about joining the San Antonio LGBT Chamber, visit: http://www.salgbtchamber.org. For more information about the National Association of Gay and Lesbian Real Estate Professionals, visit: https://naglrep.com.